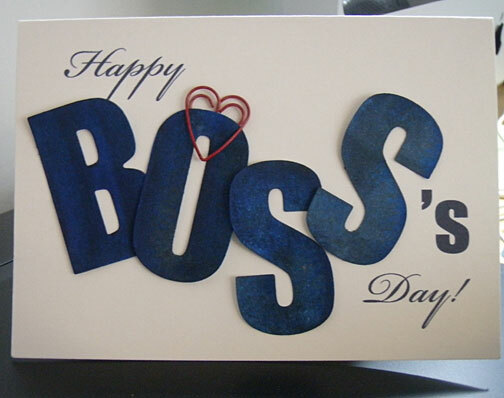 A happy boss day card to make on your computer. Use the free cardmaking template provided below to print the words on cardstock. And here are the instructions for making this computer printed greeting card. 1. Download the free template provided. 2. Open with Adobe Reader. If you don't have the Adobe Reader software, please download it here. 3. Print on Letter size off-white color cardstock. 4. Cut card and fold. 5. Cut out the alphabets for the word BOSS. 6. Paint office clip or heart shaped clip with Stazon black cherry color. Will dry fast. 7. Attach clip to the top of letter 'O' in BOSS. 8. Arrange, apply glue or tape and attach to front of your handmade card. Note: When printing the boss day card template, remember to set Page Scaling to "None". That's it! Send it to your boss wishing him or her a very happy boss's day. Sign up for the enewsletter and receive free informations, template and cliparts each month.